Exporting Contacts from iPhone: It can be a pain to transfer data from phone to phone or between a phone and computer - but it doesn't have to be that way. This article presents 3 fool proof ways detailing how to export contacts from iPhone to computer. Our easiest and most robust method comes first in the shape of the TouchCopy software. TouchCopy is the only tool you need for managing your iPhone with your computer. With it, you can copy all kinds of data like Music, Messages, Photos, Contacts and more. TouchCopy is great and you can use it locally on your computer, so you don't need to worry about syncing with iTunes, or having a Wi-Fi connection for cloud services or email (as seen in our other methods). Connect your iPhone with USB or Wi-Fi. 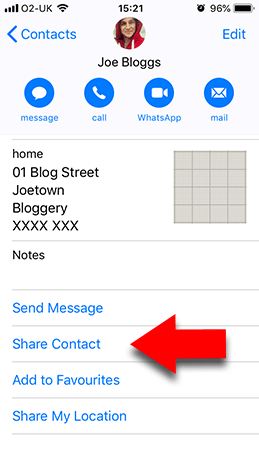 Click "Contacts" to view your iPhone Contacts. Hit "Copy as vCard" (PC) or "Copy to Mac" (Mac). Note: We won't share your Email address with anyone else, or send you spam. Using this function will save standard vCard (.vcf) contact files to the location that you choose on your PC or Mac. 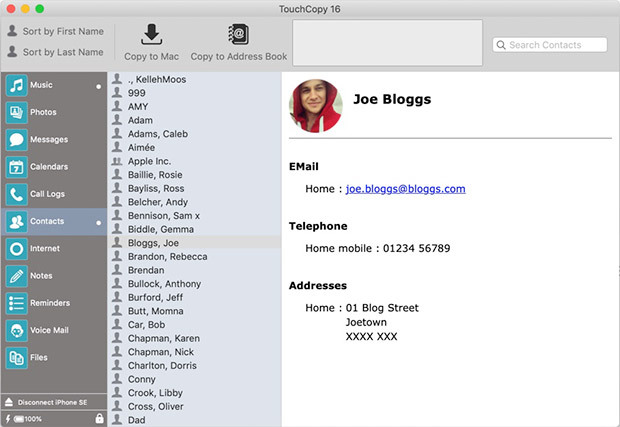 You can also save the contacts directly into Contacts (PC) or Address Book (Mac) by using the relevant buttons in the TouchCopy toolbar! Second is the use of iCloud. iCloud is a great way to sync data like Contacts and Calendars between all of your devices. This method is great for people who like to access the same data across all iMacs, MacBooks, iPhones, iPads and iPods they own, but for others who like more control over their data, Method 1 may be more suitable. 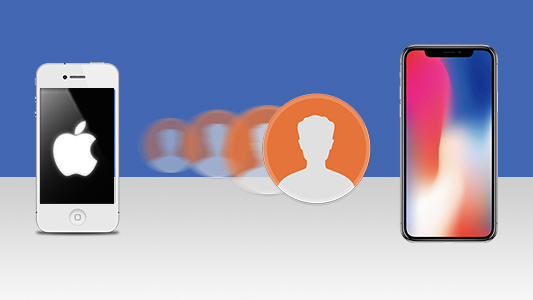 To use this method to sync contacts from iPhone, you'll need to be connected to WiFi. On your iPhone, go to Settings > [Your Name] > iCloud. 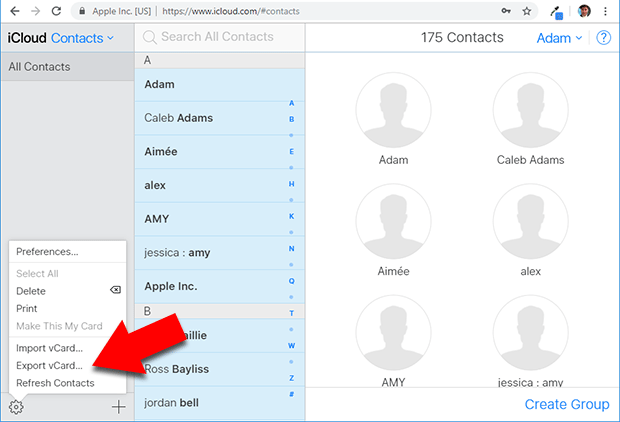 Ensure that the "Contacts" entry is toggled on (you may need to merge your iPhone contacts with any existing iCloud contacts). Next, log in to iCloud with your Apple ID from a browser. Click the "Contacts" app icon. (If you don't need to save the contacts to your computer, you can skip the next steps). Click a contact, then do "Ctrl+A" on your keyboard to select all. With all Contacts selected, click the cog icon in the bottom-left corner of the screen. Our final method is great if you need to export only a couple of contacts here and there, but does not compare to TouchCopy and iCloud for bulk exports. You can export individual contacts from your iPhone via email. Open the Contacts app on your iPhone. Tap a Contact you wish to send. Scroll down and tap "Share Contact". Compose your email and Send! Your contact will be sent as an attachment, in vCard (.vcf) format, with the email. As we saw in Method 1, we can use TouchCopy to export contacts from iPhone and import them into Outlook with only 1 click. However, if you used iCloud or email to export iPhone contacts to your computer, you can still import the vCard files into your contacts manager like Outlook or Gmail. 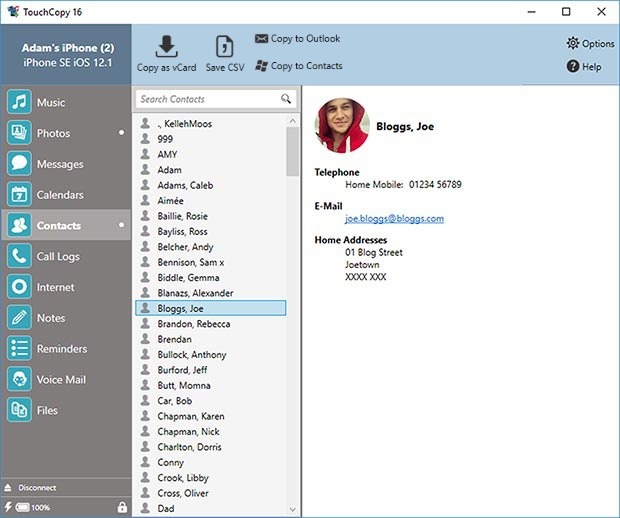 Open Outlook on your computer. Go to File > Open & Export. Select "Import a vCard file", and then click Next. For a complete guide, see Microsoft's guide. Open Google Contacts in your browser. Locate your copied vCard files. Don't forget to like & share with your friends! Export Contacts, Messages, Music and more from iPhone to your computer. Found this useful? Tell a friend! The easiest way to export iPhone Contacts to computer. Copy anything from iPhone to PC or Mac! For technical help please see our support pages. More info about us and how to get in touch. TouchCopy® is a registered trademark of Wide Angle Software Ltd.
Apple®, iPod®, Mac and iTunes® are a trademark of Apple Inc., registered in the U.S. and other countries. Wide Angle Software Ltd is not affiliated with Apple Incorporated.